Manufactured in France from 1951 until 1952. It is difficult to be found there in the nomenclature and the chronology of Scoutbox. It seems that Lumière gave the same name to different cameras and also gave different names to quasi-similar cameras. 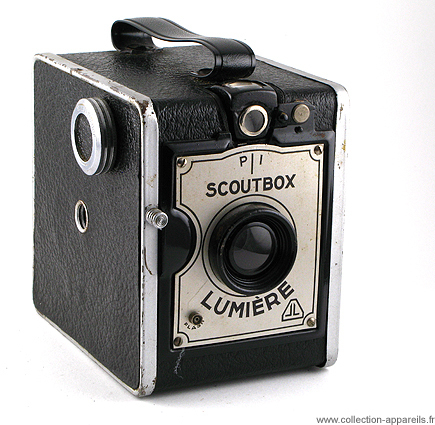 The most credible justification is that Lumière wanted to have in his catalog two ranges of box: medium of range, Scout-box and top-of-the-range,Lumibox. To try to see there more clearly, I distinguish two types of Scoutbox: those with two finders and those with only one tilting finder. From now on, the loading of film is done by withdrawing one of sides and either 3/ 4 back one of the body. There is nothing any more but one finder, but which can laterally swivel in order to allow the shooting the horizontal one or with the vertical. • Model with different completion with synchro flash: metallized front face.